The Dordogne is famous for its prehistory and so if you only have a day to devote to the Vezere valley what should you aim to see? 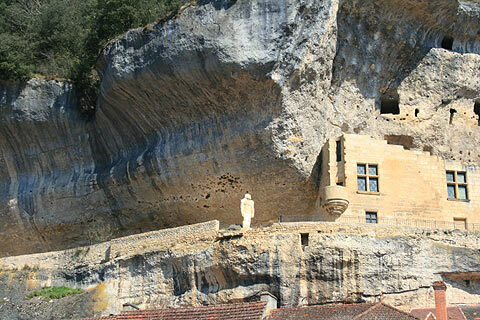 This is an insider's guide as to what to do with a day to spend in the Dordogne in the area in and around Les Ezyies and the Vezere valley - a UNESCO World Heritage site for its prehistoric caves. There are many to choose from and we have highlighted our favourites but even these are too many to do in one day and so you will need to choose those most interesting to you. Les Eyzies is the centre of prehistory in the Dordogne area. Start your day here and pay a visit to the National Prehistory Museum which houses one of the worlds biggest collection of pre-historic artefacts. Now you know all about prehistoric times you will want to visit one of the prehistoric caves. Font de Gaume is famous throughout the world as it is one of the few caves left where you can see the original prehistoric polychrome paintings. Numbers are limited to avoid damaging the paintings and so book in advance or turn up very early to try and get one of the small number of tickets given out each day. There are more than 200 polychrome paintings to be seen. 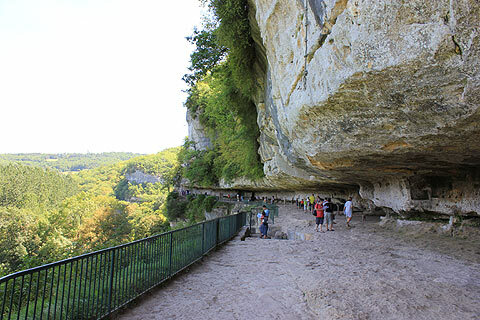 As well as the pre-historic caves the dordogne has a large number of beautiful natural caves and the Grotte du Grand Roc is one of the best of these. This is a natural cave containing an incredible display of stalactites and stalagmites as well as rare 'exentriques' which are tiny stalactites that grow in all directions. A real fairy-grotto of a cave and well worth a visit. 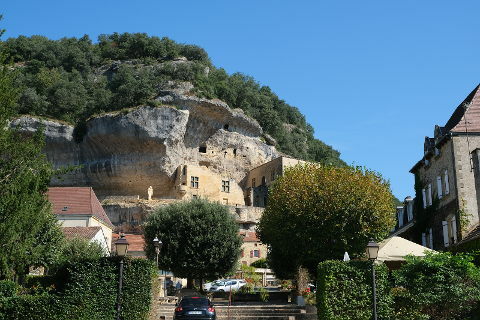 Nearby is La Roque-Saint-Christophe, an incredible troglodyte village which shows signs of habitation from pre-historic life up until the 16th century. This cave 'village' half way up a cliff has a church, a cow-shed and lots more. There are also some reconstructions of large-scale machines of construction used in medieval times. Now head on to Saint Leon sur Vezere which is yet another of France's "most beautiful villages". There really is a high concentration of them in the Dordogne department. As well as a visit to the village with its lovely church with a roof made of stone tiles, quite rare now, this is a pretty place to stop for lunch. Either a picnic by the river (you will need to bring this with you) or stop at one of the pleasant little cafés in the village. 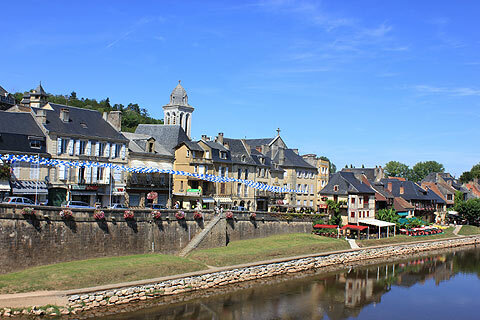 Its been a busy morning and so enjoy a more leisurely afternoon with a wander around the lovely village of Montignac with its pretty riverside setting. This would make a good alternative to Saint-Leon-sur-Vezere for lunch if you want a wider choice than Saint Leon can offer. Be sure not to miss the Rue de la Pègerie with its 14th century houses and the rivers edge with its lovely balconied houses. Of course Montignac is also home to the world-famous Lascaux caves. We hesitated to visit them because of them being a copy but they are fabulous - do not miss them. The art work is beautiful and its impossible to tell its not the original. The Chateau de Losse is an attractive castle with charming gardens and is near to Saint Leon sur Vezere and Montignac. The "most beautiful village" of Saint Amand de Coly are near to Montignac. This is another charming village with the remains of an old abbey in its centre. The Grottes du Roc de Gazella is a cliff face with cave dwellings used by pre-historic man. As well as visiting the cave dwellings there are workshops for children and adults to introduce you to cave art or making a fire. The Site troglodytique et parc de loisirs du Conquil is another park with troglodyte dwellings and also has a dinosour area. Canoeing is great fun and always very popular with children. Canoes can be hired at Les-Eyzies, Montignac or Saint-Leon-sur-Vezere. This is a great day out for a rainy day as you can just as easily visit caves on a rainy day as on a dry day. Plus Montignac is a big enough town to have a good selection of cafés and restaurants to shelter in and enjoy some of the delicious local foods such as duck, truffles and ceps. Sarlat is one of the most visited towns in the SW of France and rightly so - it is beautiful with a really well preserved medieval centre. Have a look at our one day guide to Sarlat and the lovely medieval villages nearby.